Were you aware that there is a connection between flossing and how much you weigh? Most people are not. There is an apparent connection that forms between people who do not floss often enough and being overweight. If you want to be able to have better oral health, plus loose a few extra pounds, you may want to start off by flossing each day like your dentist tells you that you are supposed to do. Most people do not floss like they are supposed to. 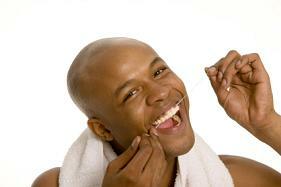 When you do not floss enough, you end up with gingivitis or a deeper form of gum disease. Out of those with gum disease, the vast majority of them are also obese or overweight. Because you are suffering from inflammation in your gum tissue, your body reacts by slowing your metabolism, and that causes your body to hold on to more weight than if you had healthy gum tissue. Something as simple as flossing can make a significant difference in your overall health, and it can even help your body shed some extra weight. If you have been trying to lose weight, but haven't found the right recipe just yet, consider getting your oral health in tip top shape as your stepping stone. It certainly isn't going to hurt you to have really healthy teeth and gums. Contact our office and go in and see what condition your mouth is currently in. Let him or her talk to you about how often you should be flossing, and if there are any areas within your mouth that are particularly problematic. Once you know what to be watching for, you can then make small changes to get the optimal oral health everyone should have.